Our newly formed group is now ready for its first meeting. As far as I am concerned, this is the only group meeting that can be called typical. No matter how well prepared the participants may be, practically everyone (including the therapist) experiences some anxiety at the first group meeting. Adequate preparation has enabled the group to gather but all the rest of the experience still lies in the realm of the unknown, which is always somewhat anxiety provoking. The patients usually meet outside in a waiting room and introduce themselves informally. When the therapist arrives, they all enter the meeting room and seat themselves in a circle. Someone may start the meeting by asking for clarification about the ground rules. But, often, each member will wait for someone else to begin. It is at this point that the therapist may routinely be expected to ‘get the interaction going’ (one of the most frequently asked questions about group psychotherapeutic techniques). The therapist does this by asking the one question he can safely assume everyone will answer: ‘Did anyone experience any anxiety about coming here today?’ Someone or another is bound to answer and the likelihood is that most will be willing and eager to discuss their common anxieties. From that point I have generally not found it necessary to stimulate interaction, to get it going, to initiate or lead or to direct group members. As the members become more experienced and sophisticated in understanding latent content, I gradually encourage them to become more and more autonomous; I intervene only when I believe it to be necessary and appropriate. I believe that the analytic work can begin in the very first session, usually with the ventilation of anxiety as just described. Once interaction has started it is not at all unusual for a patient to recount a recent dream, a recurrent dream or an old nightmare. Failing that, the therapist encourages the telling of day-dreams, fantasies and reveries. He asks members to avoid censorship of fanciful speculation about one another’s productions. In this way the different personalities begin to emerge and the first steps are taken in the development of both mutual rapport and antagonism. During these early meetings the therapist plays an active role, contributing his own spirit of warmth and optimism by a sympathetic, permissive attitude toward each patient’s ventilating his frustrating problems, dreams and aspirations. Gradually, the sparking of interaction will be taken over by the members of the group and the therapist will sit back more and more, letting the interaction develop and the tensions build up. Every well-structured group usually contains one or more catalytic agents ranging from the healthier patients—those who wish to do constructive work and get on with the process of mutual discovery and wholesome interrelatedness—to the more neurotically motivated provocateurs. Among the latter are (1) the exhibitionists, who do not hesitate to boast of their exceptional qualities and accomplishments; (2) the seducers, who are quick to inform about their sexual superiority; (3) the approval seekers, who continually stress their own infallibility or inadequacy and who collapse at the slightest breath of criticism; (4) the chronically anxious, who cannot bear a moment’s silence; (5) the attention seekers, who cannot bear to be out of the spotlight for even one minute; (6) the habitually detached, who force themselves into desperate interaction or who remain dolefully silent; (7) the compulsive organizers, who must adhere to the same rigid structure and who cannot tolerate one minute of spontaneity; (8) the compulsive socializers, who must keep the party going; and (9) patients with psychopathic tendencies. If a patient persists in remaining silent, the therapist may leave him alone and let the frustration build until the patient speaks lest he burst. In other instances the therapist may struggle to analyze a resistive silence or simply encourage the patient to speak. Those patients with weaker egos should be helped to verbalize. The therapist may, at first, ask directly for a dream or a fantasy in the hope that the symbolic nature of the communication will serve as a defense against the anxiety of self-revelation. That failing, and only as a last resort, the patient can be urged to discuss immediate or current problems of his life outside the group. With notable exceptions, most patients are prone compulsively to recite and review their current difficulties or case histories, and it is just this form of resistance that the successful group therapy tries to discourage. The recounting of dreams, fantasies and reveries and free association to these unconscious productions and tentative interpretations are among the first devices used to stimulate group interaction and establish group rapport. The next step is to encourage free association of members to each other. I used to use a technique I called ‘going around’. Here a single member was asked to free associate to each other member of the group. Eventually, as patients became more sophisticated and appreciative of the power this artificially centered position gave them, I noticed that there was never enough time and before I knew it each ‘going around’ took up most of the regular session, naturally causing extreme frustration to some other members of the group. Today, I seldom use the device, and when I do, I encourage immediate responses to the member ‘going around’. I feel the same effect can be realized by promoting a free-flowing interaction, which inevitably gives rise to free association concerning group members, and by constantly referring other free associations back to group members and familial antecedents. Let me give an example of how this might work and go hand in hand with other phases of analytic pursuit: Peter complained that he couldn’t trust women. He free-associated to his mother and sister, who were ‘always ready to jump on him’. Kay, a group member, asked: ‘Does anyone here remind you of your mother or sister?’ Peter answered: ‘Yes, Jane does. You’re like a tight spring,’ he told Jane, ‘I’m afraid you’ll suddenly uncoil and snap at me’. The analysis of resistance is also greatly facilitated by the group setting and the group process. For example, as patients interact, the person rigidly blocked in transferential interest in the analyst is helped to insight by the other members of the group. They, in turn, are quick to assert their own special investment in the authority figure while, at the same time, resenting the lack of attention being given them by the therapist or their peers. The commonly seen resistances or acting out of a missionary spirit, martyrdom, scapegoatism, and the like, are among those most easily exposed in the group as the neurotic commitments we know them to be. Another form of resistance, not so easily available for direct study in individual analysis but glaringly obvious in the group situation, is voyeurism in its more socially acceptable form of ‘living through others’. The injustice collector, the consistent diagnoser of other people’s ills, the judgment dispenser, the hider in historical detail, all these and many other resistive manifestations are clarified in group interaction and are made available as they become familiar and characteristic operations of the individual. The analysis of transference, closely allied to the analysis of resistance, is one of the most important and productive aspects of psychoanalysis in groups. The projection of parental and sibling images onto other group members is a phenomenon requiring exhaustive study, and the analysis of this transferential process is the largest single area of concentration of this particular method—except working through. Under the therapist’s guidance, patients discover the extent to which they invest one another with early familiar qualities. In the group setting, where a member may not only project a significant historical figure onto the analyst but also single out members of the group for the same purpose, the field for transference, in formation and in working through, is appreciably extended. The discovery, analysis and working through of transference is the most important work of psychoanalysis in groups since transference repeatedly interferes with the patient’s true estimate of reality and since, by its nature, it must pervade every area of the patient’s life. In the group it is possible to study this phenomenon in all its myriad mutations and to demonstrate over and over again its repetitive and pervasive qualities. Once the patient has been alerted to these general qualities of transference, he is ready to observe and analyze its manifestations in interaction. Since the transferential response is unconscious, we must expect considerable resistance to its recognition. Here again the group can be of great help. Since there is a great variety ofinteraction, the endless calling of attention to transference need not become a mechanical bore. Thus we are in a position to remind the patient time and again when he is reacting to a mask that exists largely in his mind; when his reactions are illogical, unreasonable, absurd or, at least, archaic; and when he exhibits affective disturbances or anxiety, extreme irritability, depression, fearfulness or even panic and terror. Other qualities of transference are more easily observable in group rather than in other treatment situations. Here we can see how rigid are the transferential patterns, how excessive, how helpless is the person in their grip and how inhibiting they are to projector and object alike. By examples and illustrative material presented at the moment of occurrence, the analyst repeatedly verifies these identifYing features of transference, using every opportunity possible to clarify the particular response in terms of the present reality and the possible historical background of the response. In group, when transference is evoked, the patient is asked for both the immediate stimulus, so that the validity of his response can be evaluated; the possible historical background for the response itself; and his estimate of the quality of that response. Thus searching for historical data becomes not an obsessional maneuver to evade reality but, rather, a quest specifically focused on clarification of the transference as a door to reality. I believe that the therapist who can concentrate early in treatment on the analysis of transference can shorten the duration of treatment considerably and can reasonably expect that the benefits gained from treatment will last. Human behavior is largely determined by original stimulus and the formation of early distortions. I do not believe that people function accidentally as a consequence of impulsivity or imagination that is totally self-generated and unrelated to causality or etiology. A patient’s behavior, illness and health are largely consequences of his history, and current transference is the repetition of an earlier relationship, which can be worked through. Thus there is a gradual but radical displacement of the negative history in the course of treatment. The group analyst need not avoid or reject spontaneity, inspiration, choice or accident. But neither does he give up trying to discover, at every turn, the patient’s motivation, the original causes of his pathology, its development and the laws that govern its present operation. One test of readiness for discharge is the patient’s ability to analyze and dispose of his own transferences by choosing more realistic alternatives; to recognize situations where formerly he might have reacted in transference; and to respond appropriately instead of acting out verbally his lateral transferences to other patients. The group therapist’s role is complicated, much more complicated than that of the individual analyst. Therefore, it is also one of the most controversial topics of discussion among group therapists. There are some who see him as the most important patient in the group, participating on every level as the patients participate. Others liken him to the conductor of an orchestra or the director of a play. Others see him as a ‘leader’ or, conversely, as a silent figure who represents leaderlessness and whose object is to build up frustration among group members. My view of the group therapist is much more conservative, conventional if you will. I believe the group therapist should be first and foremost a well-trained psychoanalyst. He should be trained in the principles of individual psychoanalysis and then, later, specifically for psychoanalysis in groups. He must have self-understanding and a capacity for empathy. These qualities should be enhanced by study so that they are under his conscious control. But, above all, I believe he should have the ability to scrutinize and work through his own transferences and countertransferences. This is why he needs a thorough individual analysis and, in addition, a sustained heterogeneous group analytic experience. I am a firm believer in postgraduate workshops where young and not-so-young therapists focus their attention on, and continue to resolve, their transferences and countertransferences to their patients. I hold this point of view not only to protect the patient, which is our therapeutic responsibility, but also to protect the therapist himself. Ifhe is really doing his job in the group, he must expect constant efforts to manipulate him; he cannot afford to be discouraged or thrown off balance by the intensity of interpersonal feeling that occasionally develops in meetings. He must encourage even the most timid to react to him and he must support the angry or loving patient who tests him to the utmost. He must be strong enough to lead and to exercise control where control is in the patient’s interest. He must be secure enough to relinquish the initiative to the group or to a patient, as the situation demands, without feeling that his authority is being threatened. He must be able to control any tendency to play the proselytizing missionary or arbitrary dictator. He must remind himself at all times that the meaning of the interaction with the group is the significant focus of his attention and the jumping-off point for all analysis and that, therefore, he must regard the patients in his group as partners in the analytic pursuit while, at the same time, maintaining the reality position of the guiding expert. This is by no means an easy position to maintain at all times and in all situations. Nevertheless, a conscious attempt should be made to find ways of doing so. I think there are at least two ways for the conscientious therapist to accomplish this goal. First, it is of paramount importance that he check continually on the possibility of his own countertransferences interfering with his relationship to the patients. Second, he must also look for ways to build the self-confidence and ego strength of his patients, so that the dependency on the authority is steadily decreased and material that must be repressed or hidden from that authority is released. It was in the service of this last principle that I introduced the formal concept of the alternate session, and my conviction as to its importance, theoretically and practically in any group therapy plan, has grown stronger with the passing years. The alternate session is a scheduled meeting of a therapeutic group without the therapist being present. These sessions alternate with the regular sessions, at which, of course, the therapist is always present. Usually, alternate sessions take place in the homes of the various members of the group—the objective being to create an even more informal atmosphere than usual so that interaction and participation is further stimulated. I seldom lay down formal rules for the conduct of these alternate sessions. But experience with hundreds of patients has demonstrated that the alternate sessions usually become an extension of the regular sessions and tend to preserve the tone, form and quality of the work done when the group is with the therapist. The alternate session serves many purposes adjunctive to, and helpful to, the therapeutic picture on both the horizontal and the vertical level. On the horizontal level it emphasizes the important role that interaction with one’s peers plays in therapy. Members learn that they can disagree with each other and settle their differences without the intervention of the authority. In other words, they learn that they can stand on their own two feet without running to mama or papa for protection. Many patients feel freer to interact at alternate meetings, when transferences to the therapist are less threatening or less repressive. Some report that they can experience, see and define different transferences more easily in these circumstances, and others say that it is largely at the alternate session that they can really feel they are relating to their fellow members. Necessarily, these attitudes also need to be worked through. At the alternate meetings patients have a greater chance to learn how to ask for help from their peers and, in turn, patients can give help in circumstances they would ordinarily leave to the therapist to handle. Since the relationship to authority and peers is one of the primary problems in mental disturbance, we are fortunate to have at our disposal a treatment scheme that enables us to deal with the problem practically and clinically. A group therapy plan that does this by reinforcing the individual’s interactive relatedness with his peers, instead of encouraging and perpetuating the often neurotic patterns of rebelling or submitting to authority, is, I think, a realistic one for the patient without requiring absolute surveillance by the therapist. At the same time, the regular sessions provide a setting in which authority problems can be dealt with. The first regular group sessions can be followed immediately by the first alternate session. However, if the therapist thinks the patients are ‘too sick’ to gather by themselves, he may wait until he feels more secure. I believe that if patients are well enough to function outside of hospital and engage in some sort of life outside of group, there is little reason for the exaggerated fear that gathering with fellow patients will lead to some kind of disaster. It is worth repeating that therapeutic groups always set their own limits and, if left to their own devices, will be able to control their acting out. Of course, if the therapist himself acts out and unconsciously encourages the group to do so, a problem may certainly arise. Irrationality can be infectious. But if the therapist can transmit his conviction that acting out retards therapy and can demonstrate its resistive character, the extent to which the group goes along with him will not differ radically between regular and alternate sessions. Another question that puzzles many is how the therapist can do his job when the patients, as a consequence of attendance at alternate sessions, know much more about what is going on than he does. The answer is that the therapist knows more than they do, not necessarily every detail, but more of the psychopathology, and has more of a conscious plan for working through. Besides, the alternate meeting is part of a continuum. It does not exist in a vacuum, nor is it isolated from the regular session. If anything of moment happens in an alternate session, it is bound to come up at some regular session. But, more important, the function of the alternate meeting is to help the patients, to get them to understand the nature of, let us say, the repetition compulsion or the all-pervading quality of transference, to raise questions about how they can resolve their frustration and to bring these problems back to the regular session until they can function more appropriately on their own. This brings me to my last reason for sponsoring the concept of the alternate session as strongly as I do: it gives a continuity to the group life that most patients have missed in their lives. During the long summer vacations the struggle for realistic communication can still proceed. Life need not stop just because the therapist goes away. This continuity is especially necessary for the patient who thinks he dies when his analyst is gone. This type of patient will still suffer but there is a chance of mitigating that pain when it can be discussed with the group in a relationship that already has a base of operation without the therapist. In the same way, the alternate meeting can be an important part of any short-term group therapy plan. In short-term therapy different levels of results can be hoped for or expected, but the idea of continuity and the possibility of holding the group together for a while longer through the alternate meeting plan can be very comforting to people who dread the end of help. I provide regular weekly sessions for one-and-one-half hours with the analyst, alternate meetings once or twice a week without the therapist for two or three hours at a time and selected individual sessions for three-quarters of an hour. This program allows the exploration of peer and vertical vectors and shows the optimal usefulness of each procedural variation in the therapeutic field of operation. The recovery of patients in psychoanalysis in groups has led me in individual treatment to use face-to-face sessions more and the couch less and to demand less regression. It has taught me to be more discriminating about regression. Some patients must regress in order to survive. This is regression in the service of the ego, as with borderline behavior of adolescents who behave in novel and bizarre ways as a defense against becoming psychotic. It is not unlike psychologically-determined fainting. Some regression, however, is in the service of the id or of the id and the ego. For example, a psychotic episode is preferable to certain death. And paranoid grandiosity, as a means of survival, is not a bad defense in the face of the gas chambers of an extermination camp. Acting out against authority, challenging the father or the analyst, is often in the service of the ego. The aggression expressed by group members has led me to be more challenging and provocative of individual patients. Perhaps more patients would be more analyzable if therapists did not insist on deep regression. My group experience has taught me to be less interested in the depth of regression and more interested in helping the patients see and accept reality. This raises the question of the non-discriminative necessity for regression for the development of a transference neurosis that may turn out to be a transference psychosis. That is, a trip into the pre-oedipal experience is not always necessary in therapy. It may, in fact, be contraindicated—as with psychotics and some borderlines who are already too severely regressed. For some time, analysts have been preoccupied with the harm that parents did the patient. More recently, analysts have attended to their own transferential and countertransferential roles in misusing the patient. My group experience has taught me to reconsider this focus. Group members bring out what the neurotic child in the patient does—his provocative role. Group interaction clarifies not only what has been done to the patient but what has been done by him as well. We observe, for example, how a female member intrudes whenever another patient and I interact, in order to exclude her sibling and have the mother in me to herself. Behavior is interactive: bilateral, triadic, quadratic. The child psychiatrist tends to view the mother as hurtful to the child. But the mother hurts the child, in part, because the father rejects her for her involvement with the child. This kind of triangular re-enactment in group therapy illustrates the importance of understanding behavior in its multilaterality in individual analysis and recognizing that the behavior of two persons changes with addition of a third person, or a fourth, and so on. In individual analysis I look for the unseen third or fourth member in the manifest dyad of the patient and therapist—for example, a male patient who, in his transference neurosis, experiences me as his mother and tries to escape me as he does all women would take flight largely because the father is present in absentia, a castrated appendage with whom the patient identifies. It is my dealing with his triadic and quadratic transferences, with the unseen group, as it were, within the dyad of the patient and myself that enriches my individual analytic treatment. Patients function differently in the dyad, in regular group sessions and at alternate meetings. Individual analysts who have had group therapy experience will explore the patients’ fantasies abut triadic and quadratic extensions of the therapeutic dyad. I happen to be interested in psychoanalysis in groups as a method of treatment but I do not join those therapists who would like to bring the blessing of group therapy, or of individual or group analysis, to solve mass conflict on a national or international basis. Nor do I agree with those who feel that all government leaders should be analyzed as an answer to the problems we are facing. Still, Freud’s discoveries have affected our society profoundly. Extensions of psychoanalytic thinking are evident everywhere—in psychosomatic medicine, anthropology, sociology, philosophy, in literature, theater, painting and criticism. 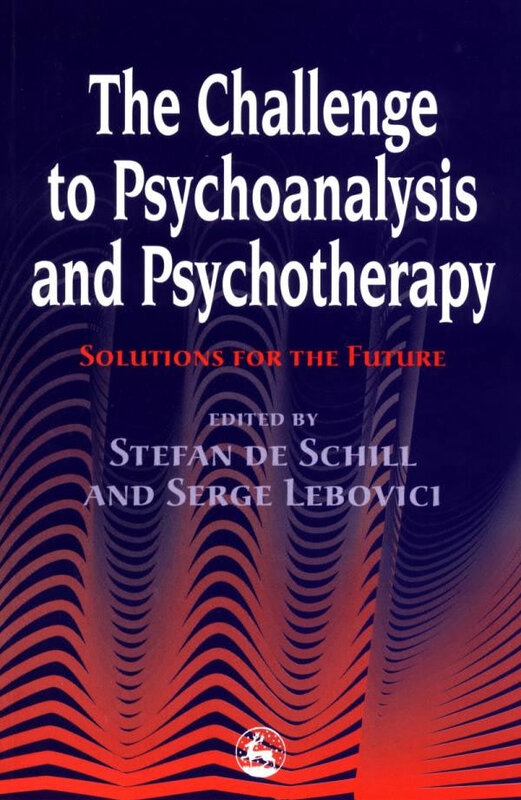 Psychoanalysis in groups is a technical extension of those theories, particularly suited to the needs of our times. My hope is that, in turn, it will create its own extensions in our professional, creative and personal lives. One extension has already materialized: the intensive form of group psychotherapy developed by Stefan de Schill at the American Mental Health Foundation. These groups, conducted in sessions about twice as long as traditional group sessions, offer a number of benefits, among them the possibility of including in the group patients suffering from severe emotional disturbances who previously could not have been considered for group psychotherapy. I suspect that many of us feel that our greatest need is for human contact and human interaction and insist on finding ways to get it. This is where I think psychoanalysis in groups can play its greatest role and deliver its greatest service, for the search to understand the thoughts, feelings and behavior of people will never lose its fascination as long as humanity exists. That fascination will die when humanity dies, and humanity will die if the search for mutual understanding dies.